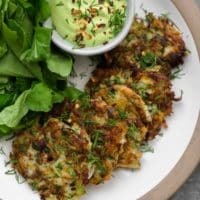 Kohlrabi Fritters with Garlic Herb Cashew Cream Sauce | Naturally.Kohlrabi Fritters with Garlic Herb Cashew Cream Sauce | Naturally. Easy kohlrabi fritters, served with a wonderful garlic-herb cashew cream sauce. Perfect for breakfast or a light lunch. Preheat the oven to 250˚F. Using the large holes on a box grater, grate the kohlrabies and potato. Alternatively, you can use the grating attachment on a food processor to do the same thing. Transfer the grated vegetables to a dish towel, wring out any moisture, then put them into a bowl. Add the onion, dill, parsley, salt, and flour to the grated kohlrabi mixture. Stir in the eggs and mix until everything is well incorporated. Heat the grapeseed oil in a large skillet over medium-high. Spoon 1/4 cup of the mixture into the skillet and flatten it gently with a spatula. Add 2 or 3 more fritters to the pan. Cook this batch of fritters until they’re golden brown and crisp, 3 to 4 minutes per side. Drain them on a paper-towel-lined plate before transferring the to a baking sheet to keep them warm in the oven while you finish making all the fritters. Serve the fritters with the sauce and enjoy. Tips & Tricks: I did a rough version of Andrea’s cashew cream sauce but this is her recipe. Link: This recipe was reprinted with permission from the Dishing Up the Dirt cookbook.